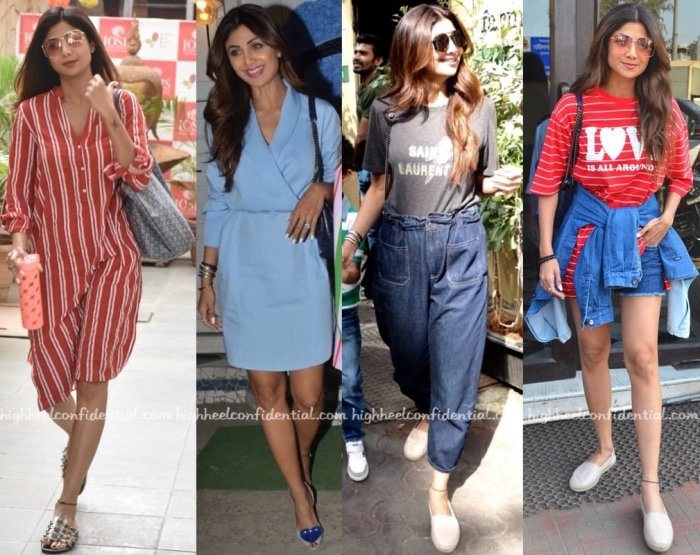 When it comes to her off-duty style, Shilpa sure keeps things easy and fuss-free. Is there a look that you liked most? As she was out and about in Mumbai, Mira was photographed in separates from Attaché. A Saint Laurent bag and pair of metallic sandals were among her accessories of choice for the evening. As easy as the separates were, the proportions didn’t really work for Ms. Kapoor. A more fitted top would’ve helped balance out the volume and make the whole thing look less fussy. Ranveer Singh has been busy promoting his upcoming movie and been opting for some casual looks while doing it.At a press meet he was spotted wearing a Fausto Puglisi jacket with Jack & Jones denim and YSL boots. For an awards function, he opted for a Bottega Veneta jacket and some serious bling via Jet Gems. While traveling for appearances, he kept it casual in Gucci separates and sneakers. At a kids birthday party, Shilpa was photographed in a denim skirt, one that she teamed with a graphic tee. A Chanel bag and pair of Saint Laurent espadrilles rounded out her look. More recently, for a round of travel, she paired her jeans with a white tee and an ombré denim shirt. Her accessories included an Anya Hindmarch tote and Gucci sneakers. Like how she wears her denim off-duty? At MAMI’s opening night event, Isha Ambani was in attendance. And for the occasion, picked Armani Privé to wear. Her accessories for the evening included a Saint Laurent clutch. She wore her look well.